In Salem, Massachusetts, in 1692, medical doctors failed to determine the cause of bizarre behavior among youngsters in that town. Religious zealots, steeped in their cult, diagnosed satanic possession to justify criminal prosecutions and serial slayings. The publication of “Why you can’t get swine-flu vaccine” in Rupert Murdoch’s New York Post (Nov. 3, 2009) by Robert Goldberg, Vice President of the Center for Medicine in the Public Interest, proves how human intelligence has devolved since Salem’s victims were blamed to popularize status quo psychopathology, social injustice, and mass murder otherwise called institutionalized genocide. According to Goldberg, partnered with Peter Pitts, mainstream media’s health pundits for consumer protection, the H1N1 National Emergency declared by Barack Obama is due to fringe lunatics who think mercury is harmful when injected by vaccines; not “vaccine shortages”. Goldberg blames people like me for heralding mercury toxicity’s links to neuro-developmental and behavioral disorders in children (e.g., autism). We are blamed for allegedly pressuring governors into ordering single versus multi-dose vials (as if the government of the US has ever listened to vaccine prohibitionists). The different vials have differing mercury concentrations (which indicts lacking industry standardization of heavy metal toxic mercury levels evidencing gross criminal negligence rationalized by pseudoscience) and the single dose vials are more costly and time-consuming to produce. Thus, we victims of mercury intoxication and vaccine injuries are blamed for the alleged vaccine shortage and national Model State Emergency Health Powers Act implementation advancing across the country. Medical industry censorship and persecution is reminiscent of the mysterious Salem witch trials. Historians speculate a combination of events, including an untimely smallpox outbreak, created the climate for this public fright. One-hundred and forty people were accused of witchcraft. Forty-three people were supposedly afflicted. Nineteen people were hanged, one person was pressed to death, thirteen people died in prison, and as many as 1200 persons were victimized in other ways. What terminated this deadly madness is the same reason Rupert Murdoch’s yellow press, the New York Post, published Robert Goldberg’s diatribe. Public support and false belief in the “witches” began to wane; as is happening now with growing distrust of vaccines and fraudulent vaccine trials. The “silent majority” sees through transparent safety assurances and government intrusions into our lives. People are frightened and fed-up with deadly disasters like the Merck company’s VIOXX and 1976 Swine Flu vaccine fraud, both certified by the US Federal Government. So increasingly ridiculous accusations from the status quo, such as Goldberg’s, are disbelieved by increasing numbers of vaccine victims. The majority of people now see through BigPharma’s fear-inflicting propaganda, exemplified by Murdoch’s articles, wherein “We the People” are accused of madness, ignorance, and now allegedly causing a national emergency. Public confidence in medicine is at an all-time low following the medically-assisted demise of our parents, friends, and siblings. The leading cause of death today is drug-induced illnesses; and these shocking statistics omit all vaccine injuries since officials criminally neglect surveying and reporting the sick and dying who’s only mistake was their misplaced faith in medical deities. It is said that medicine has extended longevity, but degenerated quality of life. Medical mistakes have made death seem more appealing than drug additions and lethal side effects for millions. For those who don’t know, Rupert Murdoch controls the majority of American news media. Rupert Murdoch is Co-Chairman of the David Rockefeller founded, Royal family of England chartered, Partnership for New York City (PFNYC). This is the world’s most powerful biotechnology trust–the heart of the vaccine industry, “genetopharmaceuticals,” and mass-media mind controlling social engineering. This is the heart of the American Medical CULTure. Their prostitutes promote and prey on people’s fear, magnify microbial menaces, and persecute natural healers and alternative care providers as though we are witches practicing witchcraft. Sen. Jay Rockefeller advances American “Health Care Reform” on behalf of leaders in brother David’s powerful Council on Foreign Relations (CFR). The Rockefeller Brothers Fund founded and finance the influential Population Council. The CFR is the most potent US Government think tank and policy director. The Population Council is the world’s most active depopulation organization funded by the US Government and Rockefeller-related foundations and institutions. The Population Council’s goal is to reduce populations by nearly two-thirds through intoxicating drugs and vaccines, including those that cause sterility. They advocate the 1977 book, Ecoscience, co-authored by Obama administration science czar, John Holdren, calling for massive global depopulation using vaccinations for sterilization. Is it simply a “coincidence” new H1N1 vaccines containing MF-59 adjuvant include nonoxynol-9 spermicide linked to spontaneous abortions? Evidencing this group’s power, on October 16, 2009, a special gathering of CFR joined vaccine specialists and social engineers led by health media propagandist, Laurie Garrett. The group discussed the urgency of the vast majority Americans rejecting vaccinations for H1N1. They articulated the need to use “shortage marketing” (i.e., fraudulently claiming vaccine shortages) to promote better public acceptance of the distrusted vaccines. Prior to this meeting, the nation’s vaccine supplies were reported ample. After this meeting, the media began administering shortage marketing, and hypnotizing the panicked public into lining up for their shots. Flumist is the H1N1 nasal spray vaccine. People taking it spread the “live” “active” laboratory-engineered unstable virus for up to 3 weeks, putting non-vaccinated persons at risk of infection and worse. These “shed” unstable viruses more readily recombine with other circulating viruses; thus, potentially more severe outbreaks and far more deadly pandemics are now expected. One such threat, a possible H1N1 hemorrhagic pneumonia recombinant, has emerged in the Ukraine, where the Chernobyl disaster occurred. The NATO superpower has fully engaged biological and chemical weapons research and development. This country was predicted to host a biological weapons release associated with H1N1 vaccines courtesy of the Baxter Corp around the time this outbreak occurred. Joseph Moshe, an Israeli Mossad agent, made this prediction on August 11, 2009, and his persecution and arrest made the national news. Moshe attempted to warn US federal investigators and law enforcers about Baxter releasing a bioweapon as they had earlier this year “accidentally” shipping H5N1-contaminted seasonal flu vaccines to labs across Europe. Baxter previously shipped AIDS around the world in their HIV-contaminated blood product, heparin. This H1N1 vaccine supplier is among the least trustworthy companies in the world. Their adjuvanted vaccines are currently banned in the United States due to US Congressional condemnation, but favored by European nations. So much for consistency in vaccine science! Here is the biggest problem. Unvaccinated persons are being vicariously “immunized” by simply going to school or work, contacting shedding H1N1 vaccinated carriers. Since more deadly viruses circulate in people, birds, animals, and the global environment, worse pandemics are predicted. Simply one “Typhoid Mary” transmitting an H1N1-H5N1 recombinant might depopulate millions of people in many nations thanks to the H1N1 vaccinations! This is what experts and officials, in fact, expect to happen. It is the real grossly-neglected reason for the declaration of “National Emergency” by President Obama who, by the way, advanced the 2005 Senate bill to fund development of the H5N1 avian flu vaccine! Murdoch and Blankfein’s allied news sorcerer is Thomas H. Glocer, the Editor-in-Chief of Reuters News Service, who is also a member of the PFNYC. His directorship of Merck & Co, the world’s largest vaccine maker, is another gross conflict of interest. Reuter’s and Murdoch’s News Corp. controls virtually all Western World propaganda, including the Associated Press which Murdoch directs as a board member. Murdoch and Glocer’s media co-broke the story of Obama’s H1N1 National Emergency declaration. Glocer broke the H1N1 Mexican Swine Flu news. Let us not forget the conflicting interests of PFNYC member Mortimer Zuckerman, Editor-in-Chief of US News & World Report and the New York Daily News, who financed the American Lyme Disease Foundation that heavily promoted SmithKlein’s disastrous Lymerix vaccine that tragically caused hundreds-of-thousands of casualties before the FDA suspended its use. All the above are advancing massive media deception and human intoxication for population reduction through H1N1 recombinations spread by vaccinations, shedding, and reassorting with circulating viruses including, we now expect, hemorrhagic pneumonia from the Ukraine. Concerned intelligent activists are demonized as “witches,” holistic physicians are ostracized for practicing “witchcraft,” and natural cures and immune boosters such as the silver hydrosols that could put Big Pharma out of business, are suppressed by officials of a murderous medical cult. Together, medical maniacs allied with media moguls have sewn the seeds for population reduction consistent with Population Counsel objectives, and their own demise as humanity awakens to the catastrophe of this unfolding humanicide. Dr. Leonard G. Horowitz is an award-winning author of 16 books and a Harvard-trained internationally recognized expert in public health and consumer protection. He views vaccinations as genocidal weapons for human intoxication and mass depopulation, and condemns gross criminal negligence and official malfeasance in the administration of the H1N1 Swine Flu “Scam.” Go to FLUscam.com for more writings by Dr. Horowitz. *The two most deadly myths in medical history is that: 1) vaccines, not mainly improvements in hygiene and nutrition, terminated polio and smallpox; and 2) vaccines are “safe and effective” when more than 90 percent of vaccine injuries and fatalities are criminally neglected, not surveyed nor reported. Author’s footnote: It is grossly idiotic and genocidal to neglect the diagnosis of general systemic vaccination intoxication then conjure up misdiagnoses requiring drug treatments. The best treatment, and public health measure, would obviously be to cease vaccinating and intoxicating people. Proof of this is adequately evidenced by the huge percentage of people with autoimmune diseases that even vaccine makers’ package inserts warn about, eczema being a most prevalent one. This ignorance and neglect of what is obvious places the medical paradigm in jeopardy of crumbling due to iatrogenocidal stupidity. NOTE TO JOURNALISTS: Ms. Kane is a freelance investigative journalist working with Dr. Horowitz to advance Healthy World Organization (HWO), a natural alternative to the UN’s World Health Organization. Information about HWO is available at: HealthyWorldOrganization.org. For more information about the flu, and what to do, go to FLU TO Dos on Dr. Horowitz’s comprehensive website FLUscam.com. CLICK HERE TO READ DR. HOROWITZ’S PREVIOUS ARTICLES ON THIS TOPIC. 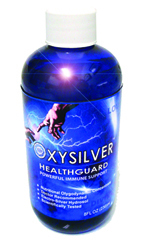 Health Tip: Take ZeoLife and stock up on OxySilver now to save lots of lives!